Millions of investors dedicate a portion of their portfolio to gold or some other precious metal as a hedge - as "insurance" - against trouble in other markets. At its base, this is a sound strategy, because precious metals generally aren't affected by the ups and downs of the stock market. This isn't a "gold service," however. Our interest is in tech investing. So let's spend today investigating what I think of as "the gold of tech." Not only can you use this investment as a hedge, but financial players are beginning to eye the technology behind it as way to disrupt the $500 billion payments industry. Why the Gemini Bitcoin Exchange Has Institutional Investors "Really Excited"
It's quite a reversal from last year, when Bitcoin was sliding to below $200. These experts, mostly CEOs of Bitcoin companies, see the Bitcoin price rising from 300% to 800% from current levels of about $445. After meandering for most of the year in the $200 to $300 range, the Bitcoin price hit a 2015 high of $333.75 today. While the price of Bitcoin dropped back to about $321 later, that's still a 36% increase over the past month. The Bitcoin price hasn't touched these levels since last December. The Gemini Bitcoin exchange, one of several Bitcoin-related projects that the Winklevoss twins have in the pipeline, has obtained two key approvals from New York regulators. 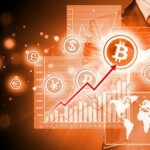 Such regulatory approval is needed to build investor confidence in the Bitcoin exchange. But Gemini also has features tailored to institutional investors. New York State's issuance of the first BitLicense to Bitcoin wallet company Circle Internet Financial, while a milestone for Bitcoin regulation, also illustrates how bumpy this journey will be. On the one hand, government officials are no longer trying to ban Bitcoin. But in trying to solve one problem, regulations often create new ones, as we've seen with the BitLicense. In a major piece of Bitcoin news, the Commodity Futures Trading Commission (CFTC) ruled that the digital currency is a commodity. It's a significant step along the road toward Bitcoin regulation. While some early adopters of Bitcoin would prefer no government involvement with Bitcoin, Bitcoin regulation is necessary for the digital currency to play any meaningful role in the financial system. Over the past week, the Bitcoin price has made is strongest move to the upside in three months - a move that took place just as the Greek debt crisis escalated. But are these two events a true cause and effect? Bitcoin News Today: After a recent string of good news, the price of Bitcoin has inched up some - and remains stable. After hitting a recent low of $177 in January, the Bitcoin price looks to be stabilizing around $240. More importantly, though, some major players are sniffing around the cryptocurrency - and are beginning to take it more seriously... with cash. Startup itBit Trust Co. has become the first U.S. Bitcoin exchange able to offer its services in all 50 states. It's another major step toward mainstream adoption for the digital currency. The New York State Department of Financial Services (NYDFS) granted a trust company charter to New York-based itBit last Thursday.